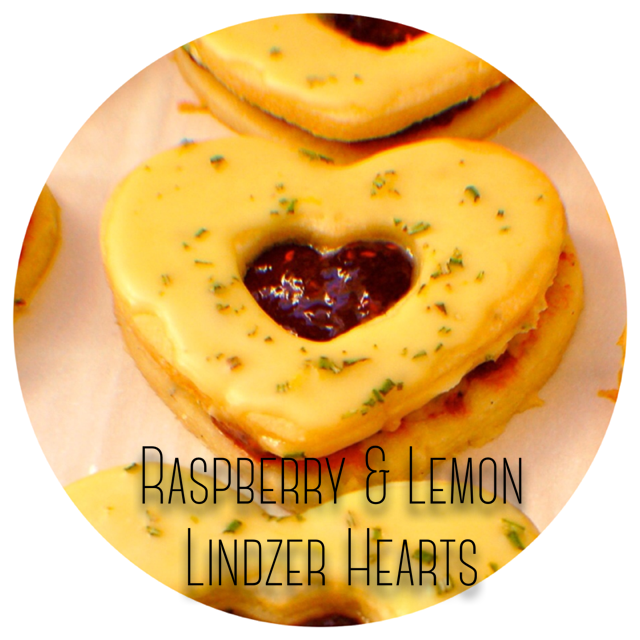 These Linser Hearts are based on the original, but with a little twist. 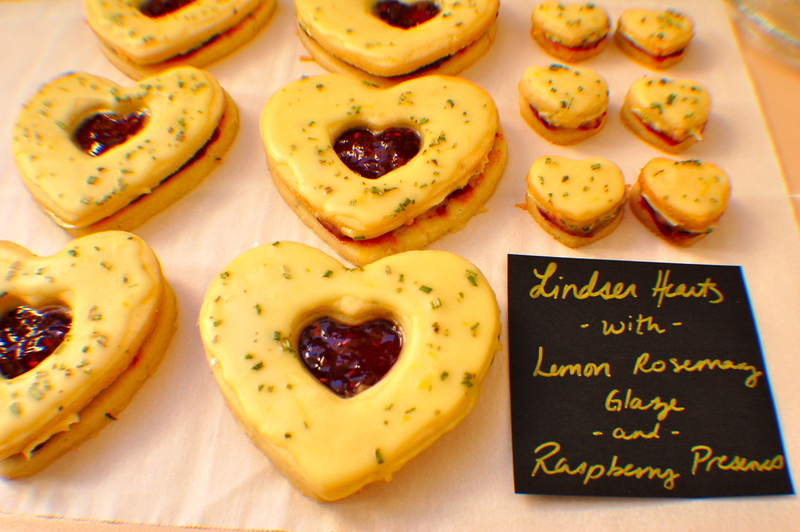 Lindser Hearts are generally made with raspberry filling and a powdered sugar top, but my experimenting resulted in a lemony-herby version of them. I experimented with different flours as part of my Baking Flours 411, so please use this recipe to substitute the flours of your choice! Cream butter and sugar in mixer on high. Add in vanilla and lemon zest and mix until incorporated. In a separate bowl, sift together flour, salt and rosemary. Slowly add flour to butter mixer 1/2 cup at a time until incorporated. Chill for 1 hour. Roll out chilled cookie dough on floured surface to 1/8 – 1/4 inch thickness. 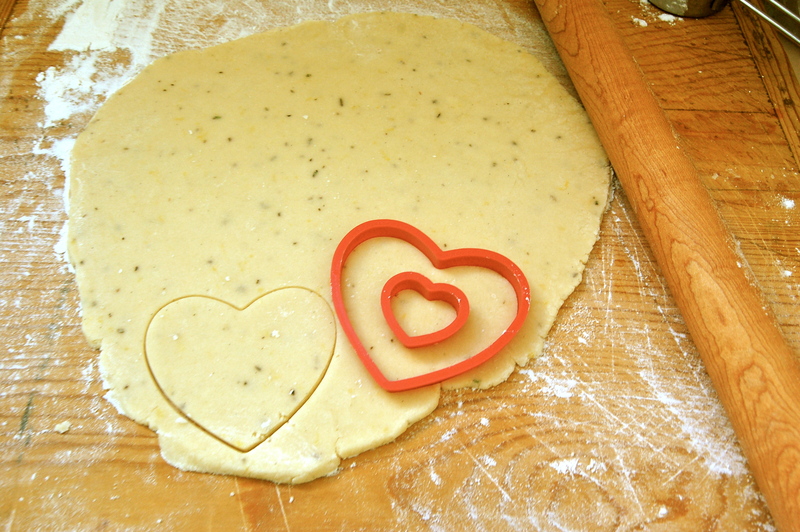 To make layered cookies, use one large and one small heart-shaped cookie cutter (I like Williams Sonoma’s De Buyer Cookie Cutter sets). Cut one heart with a hole, one without. Bake in a 350 degree oven for 10-12 minutes or until edges turn a tiny bit golden brown. Whisk together powdered sugar, lemon juice and vanilla. The consistency should be thick but spreadable, not watery. To make thicker, add powdered sugar. To thin, add a touch more lemon juice or a few drops of water. Add in rosemary at the end. 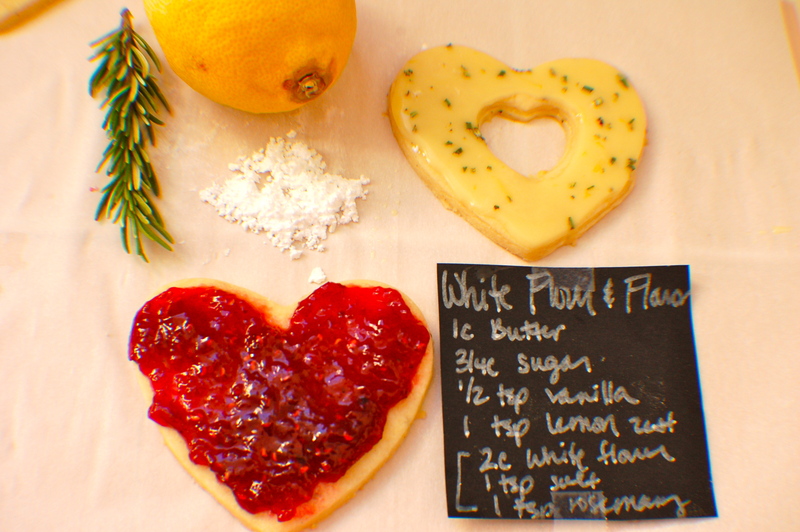 To assemble, cover the solid heart with the raspberry preserves. Ice the cut-out heart top by spooning on a small bit of icing and then brushing with a silicon basting brush. Once tops have dried fully (refrigeration helps), press together like a sandwhich. Except much yummier and prettier! Dad loved them to pieces – oops, no pieces left here.